In preparation for this weekend’s Square Dance-a-thon at Free First Saturday and the upcoming Field Trip! at Silverwood Park which both feature square dancing activities lead by Amanda Lovelee, we talked with the local artist (and do-si-do guru) about dancing, connecting, and her latest ongoing endeavor the Call and Answer Project— a documentary project about the Twin Cities’ square dancing community aimed at creating space for physical connection. When I moved to Minneapolis 3 years ago I decided to make my art practice local. So far I have done a projects that have included ice fishing, beekeeping, wild flowers, love stories and pie. Square Dancing seemed like a logical progression. 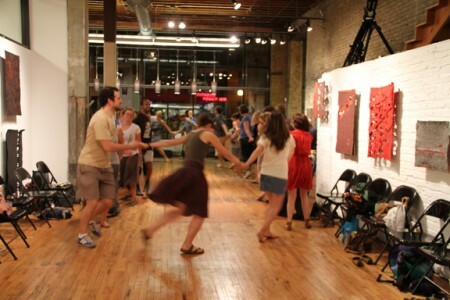 After my first time dancing I was amazed by the idea of stranger holding hands and having fun. Where else in contemporary society does that happen. Not many places I knew of. Did you always like square dancing or was it a revelation? I had never been square dancing until about a year and a half ago. A group of friends dragged me out and I was not fully convinced I was going to have fun. I was in the middle of my thesis on human connection. On our way home, from 3 hours of non-stop dancing and smiling, one of my friends said to me that was the most she had been touched in years. It clicked right away. 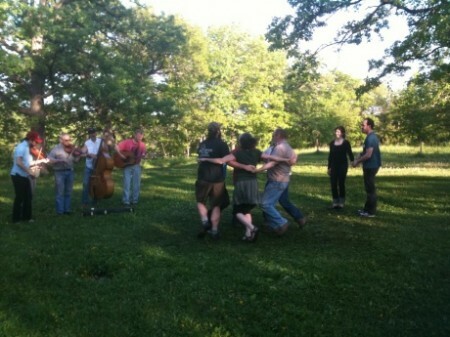 This is my next project, strangers holding hands and square dancing! Open Field is about collaboration, interaction, teaching, fun, play and joy. All things I strive work into my work. Also I was in-thralled by the idea of place in the art world was all you need was your idea and the energy to make it happen. There was no application, jury, judges, artist statement, all I needed was my excitement to share the joy of square dancing. What would you like people to experience? Most importantly I hope people have fun and learn just how great MN state dance is! Secondly I hope that people realize how fast touch, community, and connection are changing and the need to keep these things alive. As people we need other people, we need our community and companionship. When people leave the dance I want them to have met one new person, held their hand, learned their name and maybe even keep this chain going. How did the term “Objects of Utopic Structure” come about? I feel like square dancing brings people together and I was trying to think of what else does. I know that we now gather on social media sites but I wanted physical spaces, places where contemporary connection formed. I moved on from that and started making a list of physical object that help people to connect. A table, a pie, a ball, etc. I guess I thought if I could gather them all I could conserve them. How long did it take you make the documentary? One full year. I went to almost every Monday night dance at the Eagles Club, drove as far north as I think you can to the annual MooseJaw Dance gathering, attended caller trainer nights, played on their softball team and made many life long friends! The hardest scene to shoot was the scene on the frozen lake in Northern MN. It was the dead of winter and the one day I had to shoot there where fast whipping winds. It was maybe 5 degrees out. I had many people say they would dance, play music and call but as the time drew close many people dropped out. It was to cold to bring instruments out on the lake and I did not want anyone to get frostbite. I thought my dream shot was not going to happen. But a strong group of 8 people agreed. We all put on all the clothing we had, practiced once inside and headed to the lake. With no musicians all the dancers hummed the same tune while the caller also was a dancer. It turned out to be my favorite shot of the whole movie. Just the warmth of these eight people in a barren landscape. It is my hope shot. You did a project for Open Field last year. Is this project related or something complete different? Last summer I traded photographs of local wild flowers for people’s love stories. The Call and Answer Project is similar to this project in some ways. I am always interested in trading. If you hold hands with a stranger for a photograph you will receive a hand made book. I am interested in people becoming an active part of my projects and us having a cultural exchange of some sort. Nothing is free but nothing cost money. What do people wear to a square dance these days? No need for western dress or big skirts. I would suggest some comfortable shoes and light clothing. You are sure to work up a sweat! It was not until I was teaching Square Dancing in a public square in China to a group of woman in their 60’s that I realized just how much of a work out square dancing can be! 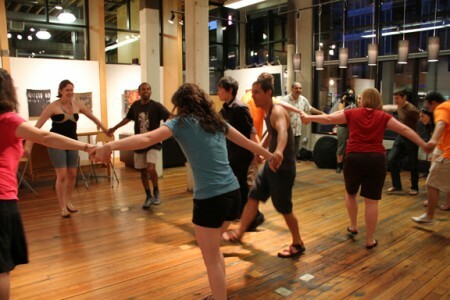 Join us and ‘swing your partner’ as Miss Lovelee leads square dancing at the Walker’s Free First Saturday this weekend or at Silverwood Park on September 24th where she is one of many artists leading activities at Field Trip!